Publisher: EA. Developer: Insomniac Games. Usually with Insomniac, we’ve come to expect terrific weaponry, excellent gameplay design and memorable firefights. But Fuse is a little different. 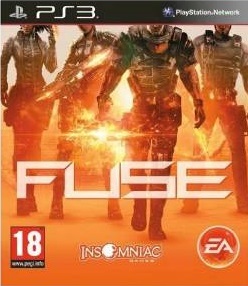 Marking one of the rare occasions that Insomniac has gone multiplatform, they teamed with EA to deliver Fuse, a co-op focused third-person shooter. And while their penchant remains intact, it’s wrapped in a disappointingly generic and bland shooter, featuring repetitive encounters and dull enemies. The only reason it’s middling, rather than flat-out disappointing, is its enjoyable co-op and different classes. At its core, Fuse is as bog-standard a third-person shooter as they come. Divided into a handful of lengthy missions, you blow through levels, shooting anything that moves and fighting some occasional boss-style enemies, such as giant mechs and air support. This is Fuse’s weakest area, as the bland level design and generic, repetitive enemies often leave levels feeling unmemorable. Even through repeated playthroughs, levels felt so similar that they began to blur into one another. A light story ties it all together, generally failing to captivate, and ending on a rather bizarre cliff-hanger. It should be a sure-fire indicator that Fuse is not worth your time. Izzy. Call her 'Isabelle': get what's coming to you. However, there are a couple of elements which, in a better game, would have made it stand out. Fuse is primarily focused on four-player co-op, and this is based around four different characters, each with their own weapon, perks and advantages. Dalton is the game’s tank, with a weapon which allows him to raise a shield, as well as place them on the ground. Jacob serves as a sniper, with a long-ranged single shot weapon and the ability to inflame enemies with his shots. Naya has the benefits of a cloaking device and warp rifle, which creates black holes. And rounding out the quartet is Izzy, whose weapon crystallizes enemies and allows them to be detonated. If those weapons sound bizarre and fun to you, that’s because they are. The great thing here is that each character feels vastly different to each other, and requires significantly altered play styles to be successful on harder difficulties. Dalton may seem a bit useless, but his power proves especially useful to protect the others. Jacob proves satisfying to master, as his weapon packs enough power to pop off heads with deadly accuracy. Izzy’s healing powers are a blessing, but unlike a lot of game medics, her weapons pack a punch too. The only odd one of the bunch is Naya, whose overpowered cloak ability allows you to stealthily melee enemies without them noticing you. Certainly helpful for getting through harder encounters, but it’s still really exploitable. So while not much of a game in terms of design, Insomniac’s penchant for weaponry stands strong. And like a lot of games, playing in co-op only adds to the fun. And being able to play the entire campaign with three of your mates is a benefit. On top of this, another mode is included in the game, known as Echelon mode. Yet another to borrow the template from Gears of War’s horde mode, you progress through waves on each map while performing certain tasks. Some force you to defend a Fuse point, while others pit you against tough bosses. It’s a familiar structure, but it proves pretty fun even if you opt to play alone. I suppose camouflage is of little relevance here, but still, bright red? EA’s penchant for technical prowess is shown here, despite the absolutely boring enemy and level designs. Well lit and textured levels often lack imagination, animation is smooth and cutscenes look pretty good. Sound is more middling, with unremarkable music, voice acting and sound effects. The only good spot is the weapons, which sound appropriately high-tech. It’s quite satisfying to turn enemies into crystal, only to hear them explode and shatter. Fuse, then, is a bit of an odd one. At times as fun as it can be boring, it really is one you need to recruit a few mates for. The diverse set of character skills and weapons make it stand out, but it’s also marred by derivative design and a bland world. While far from poor, and completely solid mechanically, you just expect something a bit fresher from the guys behind Resistance. That being said, it’s recommendable for those with a few buddies to tag alone, if not for the solo crowd.